Cover art by Amber Clark of Stopped Motion Photography. Apocalypse Ink Productions has bought the Jay Lake non-fiction book Jay Lake’s Process of Writing. Based on more than a decade of Lake’s blog posts pertaining to writing process, Lake’s down-to-earth and in-the-trenches thoughts on what it takes to be a working author will inform and inspire all levels of writers. Jay Lake’s Process of Writing has been scheduled for release in May of 2013. 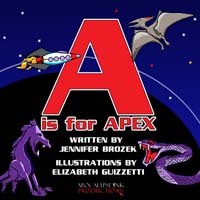 Apocalypse Ink Productions has purchased the Karen Wilson Chronicles by author Jennifer Brozek. The quartet of novellas is based on Brozek's Kendrick series, published in The Edge of Propinquity webzine. The series follows 911 operator Karen Wilson as her ordinary life in the Pacific Northwest is turned upside down by a cryptic supernatural phone call. The series is edited by John Helfers, and the first novella, Caller Unknown, will be out in November 2012.